Have a vintage, modern, old or new car, truck or bike? 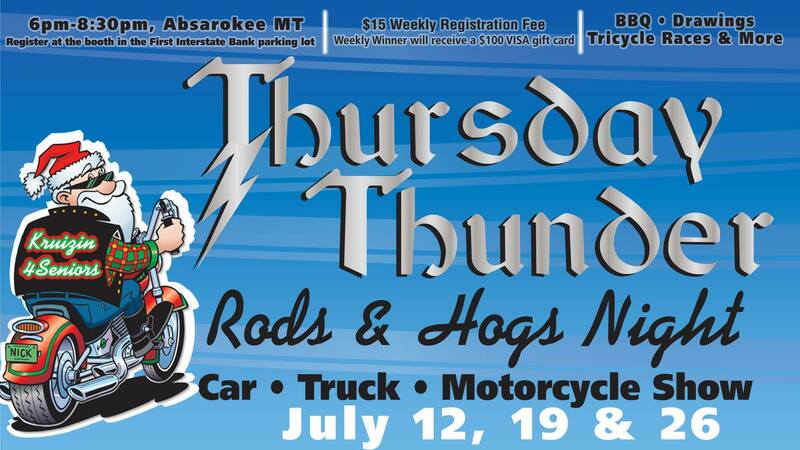 Check out Thursday Thunder Rods & Hogs and consider displaying your vehicle through entry with Kruizin’ 4 Seniors! Each Thursday in July from 6:00 to 8:30 pm. Register at the booth in the First Interstate Bank parking lot, a weekly entry fee of $15 is required. Each week, a winner will receive a $100 VISA gift card! Come join for BBQ, Drawings, Games and Tricycle Races!